After the North Sea flood of 1953 destroyed 4,500 buildings, drowned 10,000 animals and killed 1,835 people, the Netherlands began work on the world’s largest flood protection project, Delta Works (Dutch: Deltawerken). Today Delta Works consists of over 16,500 kilometres of dams, 300 structures and 1,650 sq. km. of reclaimed land (Wikipedia page). Oosterscheldekering (Eastern Scheldt storm surge barrier) is the largest and most expensive of all the projects which make up Delta Works. Constructed using custom designed and built ships, this 9 kilometre dam is the world’s largest movable flood barrier, took 10 years to finish and has since been declared one of the Seven Modern Wonders of the World by the American Society of Civil Engineers (Wikipedia page). The Maeslantkering (Maeslant Barrier) (previous featured here in minature form) is designed to protect Rotterdam’s harbour, and had to be retractable to allow shipping to take place unimpeded. If a 3 metre wave is approaching, the enormous arms swing in to meet in the middle (after 4 hours warning). Which might seem excessive until you discover that either arm would be as high as the Eiffel Tower if stood on end, and that they each weigh 4 times more than the Paris monument (Wikipedia page). Thanks to Bruce, nixx, RB, kipz0r and Sven van Heel. 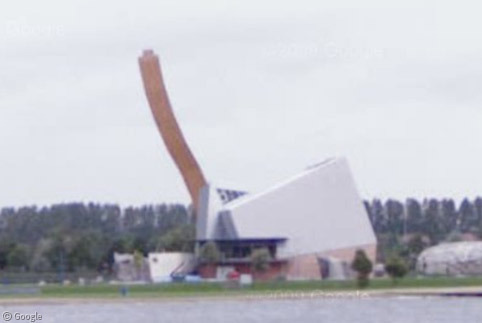 On this page (http://www.deltawerken.com/English/10.html?setlanguage=en) you can find a few interactive 360 degrees panoramic images of the Maeslantkering. Thanks Romanov, I was wondering what that was!